Most of the patents that Yahoo is suing Facebook over are for vague concepts that underly a wide variety of web services, but one is for a much more specific protocol that Facebook definitely employs: seamless communication between email and instant messaging users. If the other patents are ruled invalid for being too broad to enforce, it’s maybe this Patent 7406501 that could stick. Facebook could need a separate defense or answer to this complaint, or it could be forced into a settlement to close the case prior its IPO. My research hasn’t surfaced any other prominent companies that provide this service. Many will deliver email notifications about missed instant messages, but not actually allow users to have their full emails delivered as instant messages and vice versa. Over two years after the patent was filed, Facebook launched its unified messaging product that offers this service. 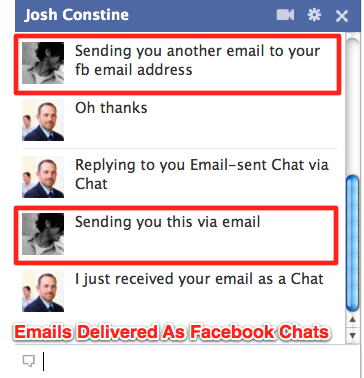 Email users can send messages to [username]@facebook.com to have them delivered as Chats or Facebook Messages. Messages or Chats sent back are delivered as emails. That means Facebook is directly infringing on Yahoo’s patent. Facebook did make some significant improvements to what Yahoo patented. Rather than blindly delivering communications as Chats or emails, Facebook dynamically assesses what the best delivery medium is. If a recipient is actively logged in and “online” to Chat, they’re delivered as Chats. If someone is on the website but logged out of chat, or are completely logged out they’re delivered as Messages. If the recipient is on Facebook’s mobile interfaces they’re delivered through the standalone Messenger product, in-app Messages, or even as SMS. The case’s outcome could include some combination of Facebook buying this patent from Yahoo outright, paying exorbitant licensing fees, offsetting it with patents Yahoo infringes on, and shutting down the feature. Facebook should start thinking which it would prefer.